An ankle fusion (Figure 1) is indicated for patients with painful end-stage ankle arthritis. The arthritis can be the result of osteoarthritis, posttraumatic arthritis, arthritis from systemic cause, such as rheumatoid arthritis, or even avascular necrosis. When considering an ankle fusion, it is important to assess the joints surrounding the ankle joint, including the subtalar joint and the talonavicular joint (See Figure 2). The reason for this is that these joints will be subject to more motion and more force once the ankle joint has been fused. The status of these joints is important in assessing how successful an ankle fusion is likely to be. If these joints have full range of motion and no evidence of arthritis, good results can be expected with a successful ankle fusion. If there is significant arthritis or stiffness involving these joints, then the results of an ankle fusion may be less predictable. The ankle fusion is performed by removing any remaining cartilage from the upper and lower bones in the ankle, the tibial and talar surfaces of the ankle joint. The underlying bone is then prepared with a combination of instruments to create fresh bony surfaces that can knit together in a similar manner to the way a fracture would heal. These surfaces are then fixed in position with strong screws or plates (Figure 1). The actual position of the ankle joint is critical in performing a successful ankle fusion. The joint should be positioned in neutral dorsiflexion (right angles to the lower leg) and in slight hindfoot valgus (the heel angled slightly to the outside). This allows the most motion through the surrounding joints and allows the patient to walk as normally as possible. The ankle can be approached through an incision on the outside (lateral) aspect of the ankle or on the front (anterior) of the ankle. It is also common to cut the smaller bone of the lower leg (the fibula) and reposition that so that it is included in the fusion mass, in order to approach the ankle. If the ankle has limited deformity, arthroscopically assisted approaches may also be an option. It is common to augment the ankle fusion with bone graft. This can be taken from the patient (autograft) just below the knee or from the pelvis. The cellular elements in the bone graft help improve the chance of the rate of ankle fusion. Patients use crutches (or a wheelchair) and mobilize without bearing any weight on the operated leg for the first 6-8 weeks after surgery, in order for the ankle fusion to heal. During this time, patients are usually in a cast, or cast-boot. 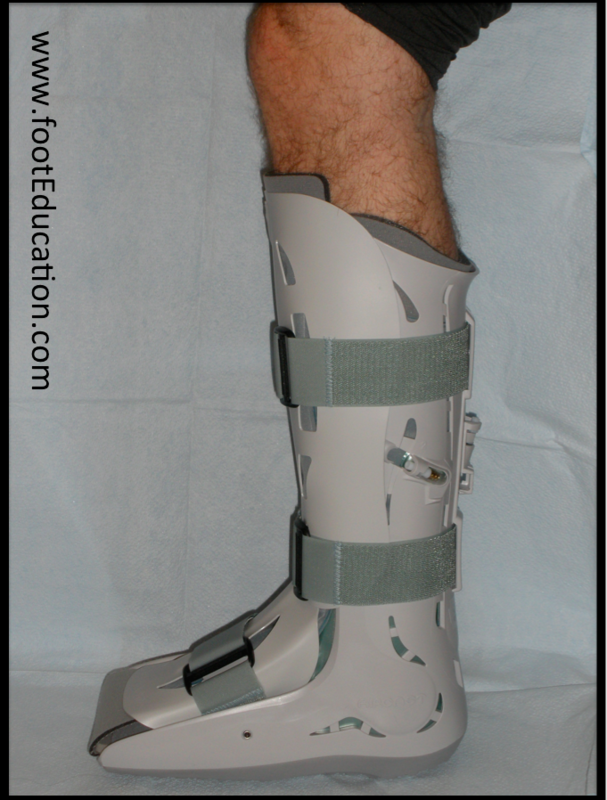 At 6 or 8 weeks post operation, if x-rays demonstrate satisfactory healing, patients are then allowed to begin weight-bearing as tolerated in a protective cast boot. This boot can be removed to allow showering and physical therapy. At this point, physical therapy is started. Patients will work on strengthening their muscles, improving their gait, and working on their range of motion. They are typically walking in a cast boot, walking with a cane, or walking with another assistive device. At that point, patients can begin walking in a shoe – often with a supportive ankle device, such as an ankle lacer. They will be asked to gradually increase their activity level during the coming months. A rapid increase in activity level will often cause a sudden increase in symptoms, such as pain and swelling. If this happens, patients should back off their activity level for 2-4 days until their symptoms settle down. Patients will obtain approximately 80% of their recovery by the 6 month mark. However, it is often 15 or even 18 months before a patient reaches their point of maximal improvement. A nonunion occurs when the fusion site fails to adequately knit together. The nonunion rate is dependent upon: the surgical technique; the patient’s underlying condition; whether the patient smokes cigarettes; and the patient’s compliance with the postoperative non weight-bearing protocol. The typical nonunion rate is on the order of 5-10%. If a patient does have a nonunion or a delayed union, they may require a longer period of non weight-bearing and, in some instances, will require revision surgery. Fortunately, injuries to nerves are relatively uncommon in ankle fusions. Nevertheless, given the extensive nature of the procedure, on occasion the major nerve at the back of the hindfoot [the tibial nerve] will be stretched or injured, leading to abnormal sensation (or loss of sensation) in the sole (plantar aspect) of the foot. This can lead to the development of significant pain over the course of the nerve or even to the development of Complex Regional Pain Syndrome (CRPS). Small sensory nerves may also be damaged or cut during the operation. This occasionally leads to loss of sensation in part of the foot (usually around the incision) and, in a small percentage of patients, may even lead to painful nerve type symptoms. If a small nerve is irritated and creates pain, it needs to be treated with fairly aggressive desensitization (massage) therapy performed by a physical therapist. Some pain may still be present after a successful ankle fusion. It is important to appreciate that an ankle fusion is highly successful in eradicating the pain that originates from the arthritic ankle joint. However, it will have no appreciable effect on symptoms that are originating from ligaments and tendons outside of the ankle joint, or on arthritis that involves any of the surrounding joints. In fact, arthritis in the surrounding joints, such as the subtalar and talonavicular joint, may actually be worsened.